High Impact Practice:Develop an effective supply chain management system for family planning so that women and men can choose, obtain, and use the contraceptive methods they want throughout their reproductive life. The World Health Organization (WHO) estimates that about one-third of the world’s population lacks regular access to essential medicines, which include contraceptives (Hogerzeil et al., 2011; WHO, 2011). Supply chain management (SCM) of contraceptives and related products, such as the equipment, instruments, and supplies required to provide long-acting and permanent methods (LA/ PMs), is critical to the effective operation of family planning programs and to their overall success. Country experience illustrates that coordinated and focused action from all sectors (both public and private) can help supply chains operate more effectively and serve health programs better. building local SCM capacity, including human and institutional capacity, infrastructure, and systems, such as Inventory Control Systems and Logistics Management Information Systems (LMIS). The logistics cycle1 depicts the functions that work together to bring family planning products to the clients who need them (see Figure 1). Supply chain management is focused on serving customers, with an emphasis on ensuring the “six rights” to these customers: the right product, in the right quantity, in the right condition, in the right place, at the right time, for the right cost (USAID | DELIVER PROJECT, 2011b). Strengthening supply chain management, within the overall health system, is one of several “high-impact practices in family planning” (HIPs) identified by a technical advisory group of international experts. When scaled up and institutionalized, HIPs will maximize investments in a comprehensive family planning strategy (USAID, 2011). For more information about other HIPs, see http://www.fphighimpactpractices.org/overview. Supply chain management is “the set of activities involved in moving a product from the ultimate supplier to the ultimate customer” (for example, clients seeking family planning services). Supply chain improvements enhance quality of care and support choice of methods by reducing stockouts of contraceptives and related equipment. In Rwanda, strong government commitment to family planning and supply chain enhancements has contributed to decreased contraceptive stockouts. In particular, the Ministry of Health (MOH) with support from its partners has strengthened such logistics functions as: quantification; collection of timely, good-quality logistics data; and donor and public-sector coordination (USAID |DELIVER PROJECT, 2009). Stockout rates for the four major contraceptive methods provided by the Ministry subsequently declined significantly (see Figure 2). For example, stockout rates of implants dropped from 37% in 2004 to 8% in 2006 and to 3% in 2011(Rwanda MOH et al., 2012). These and other improvements to the family planning program contributed to a dramatic increase in the modern contraceptive prevalence rate, from 10% in 2005 to 27% in 2008 and to 45% in 2010 (National Institute of Statistics of Rwanda et al., 2012). Better supply chain management improves cost-effectiveness and efficiency of the supply chain. In Zimbabwe, the government and partners implemented a delivery approach used successfully in the commercial sector called the “Delivery Team Topping Up” (DTTU) system to improve the public-sector family planning supply chain. In DTTU, delivery teams from the central warehouse calculate resupply quantities—not already overburdened service providers at health facilities, as would traditionally be the case. The delivery teams “top up,” or replenish, the inventory at each facility, thus reducing the reporting burden on service providers so they have more time to focus on clients. Not only have stockout rates declined dramatically for products handled by the DTTU system, but costing analysis also found that DTTU teams can deliver commodities at a lower average cost than a fully funded traditional system (USAID | DELIVER PROJECT, 2010b). The early successes of the DTTU approach for contraceptives and condoms have since led to its adaptation for the management of products of other health care programs in Zimbabwe, including for prevention of mother-to-child transmission of HIV, tuberculosis, malaria, and primary health care. Improved logistics functions, including forecasting, procurement, product selection, storage, and distribution, ensure contraceptive product availability, which, in turn, contributes to improved contraceptive use. Analysis of family planning logistics data from 11 countries shows that countries with high-functioning public-sector logistics systems have higher product availability and higher use of modern contraceptives, as illustrated in Figure 3 (Karim et al., 2008). A recent analysis of data from Demographic and Health Surveys (DHS) and Service Provision Assessment (SPA) surveys from Kenya, Rwanda, Tanzania, and Uganda found that regional family planning supply and service environment factors are significantly associated with contraceptive use. The study found that an average increase of one contraceptive method available in a region is associated with an increase in women’s odds of using modern contraception by 50% (if family planning facility density in the region and other individual-level variables are held constant) (Wang, 2012). Ultimately, any increase in contraceptive use requires a parallel increase in availability of the commodities needed to provide family planning services. * CPR is for resupply methods (condoms, pills, and injectables) from public-sector sources. 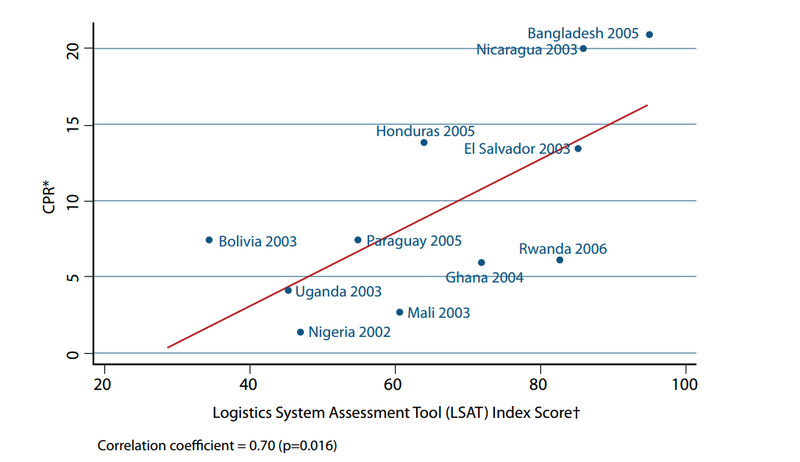 to measure system performance; a higher LSAT Index Score indicates a better performing logistics system. While interventions to strengthen the supply chain depend on the country need and context, the following is an illustrative list of critical elements. Implement and maintain a robust Logistics Management Information System (LMIS). Data drives a supply chain. Without the ability to make supply-chain decisions based on reliable data, no supply chain can effectively assure the “six rights” to its customers. An LMIS collects data about contraceptive use, stock levels, quantities on order, and losses and adjustments, enabling programs to track and manage the movement of contraceptive supplies and share information for decision making. Since an LMIS accounts for products within the system, it can reduce loss, damage, waste of products, stockouts, and overstocks, which improves accountability and customer service. Having access to information—whether through paper-based or computerized systems—will enable managers to know what is happening throughout the system, to identify problems, and determine appropriate solutions. Where appropriate and feasible, an LMIS can capitalize on a country’s IT infrastructure as it grows and develops to facilitate the collection, analysis, and sharing of data. Using mobile phones, for example, to report logistics data can improve the timeliness and quality of reporting. Web-based LMISs with online reporting of logistics data expedite data sharing between levels and stakeholders. Furthermore, capturing logistics data electronically facilitates its use in quantification processes; with more accurate and timely consumption data, forecast accuracy improves. In Sierra Leone, Madagascar, and many other countries, UNFPA CHANNEL software is helping reduce stockouts and improve supply chain management. Undertake regular quantification exercises. Quantification is a critical supply chain activity that links information on services and commodities from the facility level with program policies at the national level, which is used to inform higher-level decision making on financing and procurement of commodities. The quantification process includes both a forecasting and a supply planning step and should be conducted annually. Forecasting estimates longer-term trends in the use of products over several years. The supply plan covers a one- to two-year period and specifies the quantities and costs of products required for family planning programs. It also determines partner commitments to meeting these requirements, whether there are gaps, and when products should be procured and delivered to ensure an uninterrupted supply. In addition to conducting routine quantifications, it is important to build the capacity of national-level staff to conduct and manage these national exercises. 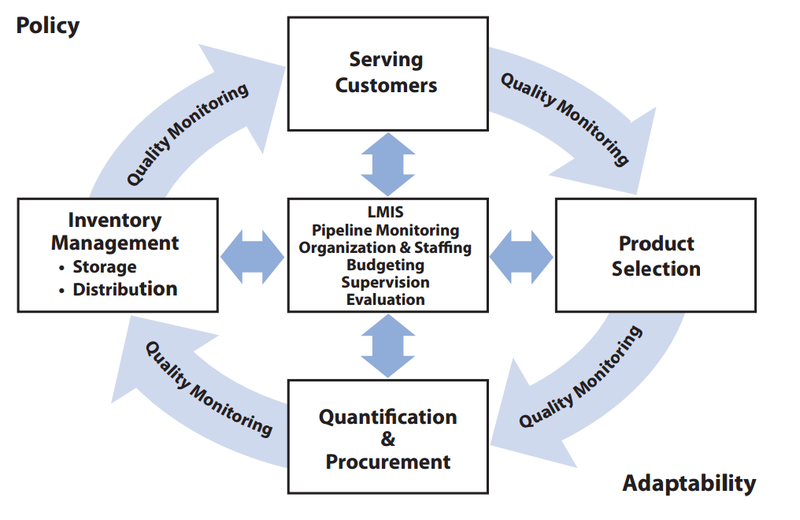 Results of a quantification exercise help programs maximize use of available resources for procurement, advocate additional resources and supply chain improvements, and inform manufacturer production cycles and supplier shipment schedules. In particular, programs can use the supply plan to monitor how well partners fulfill their commitments to ensuring full supply of products through timely financing, procurement, and delivery. Support mechanisms for more flexible procurement. Supply chains need agile, flexible procurement mechanisms that are capable of delivering quality products at low cost. There are a number of initiatives to strengthen national and global procurement, including pooled procurement, an approach involving purchasing done by one procurement office on behalf of a group of facilities, health programs, or countries (Abdallah, 2005). Examples of pooled procurement initiatives include national procurement agencies, USAID’s Central Contraceptive Procurement, UNFPA’s AccessRH, the Global Fund’s Voluntary Pooled Procurement Mechanism, and the Global Drug Facility for TB. The use of framework contracts, with fixed prices and variable volumes, can also ensure a more flexible response to unpredictable demand. Explore private-sector partnerships and outsourcing. Partnerships with, and outsourcing to, third-party logistics providers (3PLs) are considered best practices in commercial and developed-country settings (Jacoby, 2009). In developing countries, more governments and donors are considering options to engage the private sector and NGOs. For example, countries often leverage NGOs to deliver supplies. Outsourcing such functions can remove burdens from Ministry of Health staff and leverage core logistics competencies found in the private sector. On the other hand, while managing a contract may require fewer resources than doing the work in-house, it requires careful oversight of the outsourced contractors. Furthermore, in some countries, there may be restrictions on contracting or funding, or political opposition to it because of lost jobs. Strengthen supply chains to the last mile. Community-based distribution (CBD) offers the potential to significantly increase access to and use of family planning services, particularly by underserved groups. Although these programs often have established mechanisms to train and supervise CBD workers, they usually devote limited resources to SCM. CBD programs have inherent characteristics that require unique supply chain considerations, including the distributor’s educational level, volunteer or part-time status, and access to resupply. Simple resupply procedures that use good logistics practices can be achieved even among health workers with low literacy levels. For example, Malawi successfully implemented an SMS reporting system for contraceptive resupply among Health Surveillance Assistants (HSAs), based on individual HSA consumption levels without the need for complicated calculations. Accurate calculation of resupply results in less stock imbalances, and therefore less wastage and fewer stockouts (JSI Research and Training Institute, 2012; JSI Research and Training Institute, 2010). Consider integration of services and products. Integration of family planning services into other health services is increasingly common and often leads to merging of programmatically separate (or vertical) supply chains as part of broad health sector reforms. Although integration may reduce redundancy, it does not always lead to improved product availability and customer service. Integrating supply chains simply as a direct reflection of health service reform does not automatically improve performance. Commercial-sector supply chains illustrate that products do not necessarily need to be stored in the same place, delivered on the same truck, or procured in the same way, even if they are offered to the client at the same time. In the commercial sector, it is typical to have many product streams or segments managed through one integrated supply chain. Companies use segmentation analysis to analyze product and customer characteristics to identify commonalities, and then organize the supply chain into segments based on customer needs and product requirements. The Government of Chile uses framework contracts to pool procurement of essential medicines in a decentralized health system. These contracts save the Chilean government nearly US$8,000 per procurement in management costs and helps create a more agile supply chain. After ongoing policy dialogue and advocacy efforts, in 2010 the Ministry of Health in Mongolia signed a long-term strategic partnership agreement with the private-sector company MONGOLEMIMPEX Concern (MEIC). MEIC is now the key partner dealing with physical receipt, storage at central and provincial levels, and distribution/transportation of all health commodities donated and procured by international organizations and officially regulates the service charge issues in Mongolia. This strategic action is a useful step toward strengthening public and private partnership in the health sector and improving the national health supply chain. To help support the national family planning program in Zimbabwe, the government and partners established a Reproductive Health Commodity Security Coordination Committee. The committee comprised 12 key partners and was cochaired by the Zimbabwe National Family Planning Council (ZNFPC) and a UN agency. The committee met quarterly, with a fixed agenda that included review of a joint programming matrix, a multiyear funding framework, and ongoing research, monitoring, and evaluation. 1While the terms “logistics” and “supply chain” are often used interchangeably, there is a slight distinction between the two. The supply chain includes global raw materials, manufacturers, and supply and demand dynamics, while logistics tends to focus more on specific tasks within the health system of a particular program. 2The Procurement Planning and Monitoring Report (PPMR) is a monthly report that describes the stock status of contraceptives in a number of countries. By encouraging countries to report standardized data and by informing global and national partners of supply situations in countries, the PPMR provides critical information needed to prevent or mitigate stock imbalances. 3RHInterchange is a free, web-based tool that provides accurate information on contraceptive supply orders for more than 140 countries. 4CARhs brings together representatives of the world’s key commodity suppliers to address the short-term supply crises that periodically befall countries. See also related HIP briefs on Supportive Policies and Regulations, Financing, Coordination and Planning, and Commitment on the HIPs website http://www.fphighimpactpractices.org/briefs. Abdallah H. West Africa reproductive health commodity security: review of pooled procurement. Arlington, VA: John Snow, Inc./DELIVER PROJECT for the U.S. Agency for International Development; 2005. Ahmed, Kabir (UNFPA). Email to: Leslie Patykewich (John Snow, Inc.). 2012 July 24. Campbell, Bruce (UNFPA). Email to: Leslie Patykewich (John Snow, Inc.). 2012 July 9. Subject of email: Mechanisms for planning and coordination. Goya F. Balance y Perspectivas de los convenios marco. Presented at the VI Annual Conference on Government Procurement in the Americas; Lima, Peru; October 2010. Jacoby D. Guide to supply chain management: how getting it right boosts corporate performance. John Wiley & Sons; 2009. JSI Research and Training Institute, Supply Chains for Community Case Management (SC4CCM) Project. Quarter two monitoring data; April 2012. JSI Research and Training Institute, Supply Chains for Community Case Management (SC4CCM) Project. Malawi baseline results. Arlington, VA: SC4CCM Project; June 2010. Rwanda Ministry of Health (MOH) and USAID | DELIVER PROJECT. Supply Chain Manager (SCM) database. Kigali, Rwanda; August 22, 2012. This document was originally drafted by Lilia Gerberg, Ellie Bahirai, Leslie Patykewich, and Linda Cahaelen. Critical review and helpful comments were provided by Bridgit Adamou, Gifty Addico, Kabir Ahmed, Regina Benevides, Alan Bornbusch, Bruce Campbell, Selam Desta, Leah Freji, Roy Jacobstein, Ricky Lu, Shawn Malarcher, Erin Mielke, Edgard Narváez, Ilka Rondinelli, Marcella Rueda, Adrianne Salinas, Sukanta Sarker, Ruwaida Salem, Shelley Snyder, Jeff Spieler, and Jane Wickstrom. This HIP brief is endorsed by: Abt Associates, EngenderHealth, FHI 360, Futures Group, Georgetown University/Institute for Reproductive Health, International Planned Parenthood Federation, IntraHealth International, Jhpiego, John Snow, Inc., Johns Hopkins Bloomberg School of Public Health Center for Communication Programs, Marie Stopes International, Pathfinder International, Population Council, Population Services International, University Research Co., LLC, United Nations Population Fund, and the U.S. Agency for International Development.